Dewey Lambdin is an American nautical historical novelist. 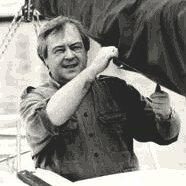 He is best known for his Alan Lewrie Naval Adventures series, spanning the American Revolution and the Napoleonic Wars. A member of the U.S. Naval Institute and a Friend of the National Maritime Museum in Greenwich, England, he spends his free time working and sailing. Besides the Alan Lewrie series, he is also the author of What Lies Buried: a novel of Old Cape Fear.